Heavenly blog! : No. 873: Egil Svartdahl made it brilliant as caretaker, but that proclaims it is thin! No. 873: Egil Svartdahl made it brilliant as caretaker, but that proclaims it is thin! Egil Svartdahl made it brilliant as caretaker, but that proclaims it is thin! When I grew up in the 80s was Egil Svartdahl in the wind on Hedemarktoppen as caretaker. The "correct" caretaker entertains was Trond-Viggo Torgersen. 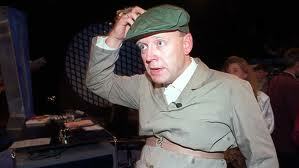 But in fact, Egil Svartdahl was not so much worse. It's amazing that not Svartdahl continued there? As a preacher, he has not be anything other than a great tragedy! He has always given people stones for bread! Then Egil Svartdahl was Karmøy! Egil Svartdahl was Karmøy where I grew up in connection with a television program. There he sat with a older sister who wanted him to pull manna grains for encouragement for the day. This would also Svartdahl. He pulled up mana grained, there stood up something such as repent, etc. The old lady chick thought he had to draw again, it was not about getting such aloft. Svartdahl pulled again, and the same message came. Repent! Then there was suddenly a little quiet, but then said chick now we draw no more manna grains. And the program went ahead. Egil Svartdahl is surely saved? But he has obviously not calling and equipping to preach God's word. It is here that the problem is so many who grow up in Christian homes. They never get her own experiences with God, but is that people who can these "Christian" jargon. But have never really experienced themselves. It is here at this level Svartdahl located. But when Christianity is so much "inbreeding" where one has grown up with being a Christian / religious. So it has with recognition effect. He has obviously not something on a soapbox to do, if it is to preach God's word. But that entertains? There he was clever. Svartdahl never got anything but just impersonated others and nonsense. When he started TV programs on Philadelphia in the early 1990s there was also entertainment etc. And everything else goof! No, here there is not much for the spiritual life to get. Nr. 15. I wonder one thing, who is this TV pastor and juggler Egil Svartdahl? I wonder one thing, who is this TV pastor and juggler Egil Svartdahl? Totally agree with you that he is a juggler and a showman, but your question is who he is? I know him very well when I during my adolescence in the 80's were a lot of summers on Hedemarktoppen both the Youth Festival and Summer of the Pentecostal church on Hedemarktoppen! There were also, he was a staple, and for a Spirit-filled man who I was then, as now he was a true disorder. It was laughing and fun, and the preaching of God's words were empty, meaningless and it gave me nothing! Gradually, as he came into the church Filadelfia Oslo with TV work when I started Smyrna Oslo around 1990. Then it was in collaboration with an actor Per Christensen certainly was a role model for him? There were so many strange things he did and said at the time, including that he wanted 10 mosques here in Oslo and 10 churches in Muslim countries. Where does Egil Svartdahl actually belong? We read about him and the kind of preaching God's word more places where it is empty prophesied to him that such preaching will appreciate in the future. 2. Tim. 4. 3 For the time will come when people can no longer endure sound doctrine, but as they see fit, they take themselves teachers, for they will have that itch in your ear. 4 They will turn their ears from the truth and stick to the myths. Here Egil Svartdahl feels at home. He cooperates with the majority, even with false prophets like Åge Åleskjær. Everything to gain greater foothold with its human and populist message, which is a form of a gospel as it is bloodless, tooth loose and without salt sting in it. Scripture says clearly how to act in the face of this, although he is perhaps the most popular preacher today in the Free Church of the Christian Norway. 2. Tim. 3. 5 In the outer, the godliness, but denying its power. Turn away from these people! Interesting how godly like and right it seems. Notice what fraces they use and how good these are with words, but it is only verbiage. But this preaching is false and it seems they use it to hide and even indulge themselves and make a popular message and money out of Christ's teachings, they know what people want to hear, so they can continue in its carnal and unconverted life and realities! It is frightening and alarming that so few see this and warn about him. But he will tender all over and people praise him, but is he a wolf in sheep's clothing spiritually? Laodicea was in Lykosdalen, not far from the beautiful limestone rock Pamukkale and Hierapolis ruins city (city of the dead). This is near the modern city Denizli, which is especially known for textile production of cotton. At the foot of the mountains in the distance that can be seen from the height of Pamukkale is located on, was the ancient Colossus. Furthermore, it presents Jesus as Amen, who is the fulfillment of all God's promises. He is the only 100% truthful faithful witness. He is the Son, not Father. Yet he is like his father. the first Christians and the Bible. 1. Cor. 8. 5 It is NOK-called gods in heaven or on earth, it's many "gods" and many "lords". 6 But to us there is only one God, the Father. By him are all things, and we are made to him. And for us it is only one Lord, Jesus Christ. Through him all things, and we live by him. is a Spirit who is Holy. Not a "God-person," but God and the Spirit of Christ. humbly submit to God's word. 3) Those I did not expect to see there are there. And the Trinity is selvmotsiggende and unbiblical. Let me take an example. Here it is mentioned that the antichrist spirit in the world but not the Antichrist. So it is with Jesus. His Spirit - the Holy Spirit - is in the world, but he personally sits at the Father's right hand. In other words, is both the antichrist spirit in the world and Jesus Kristis Spirit likewise. But why make a distinction between the Antichrist and Jesus? Suddenly one is that his own spirit is a fantasy person of God. Where is this from, even among evangelical Christians? Actually, the Trinity an ancient Egyptian and Hellenistic. Continued as a Catholic doctrine from ca. 390 AD But that will hold onto this I can not do anything, just to keep the word of God. 15 I know your works: you are neither cold nor hot. I wish you were cold or hot! Laodicea had a big problem with water supply. The local sources were contaminated, and when they tried to lead the water through the aqueduct to the city, the water was lukewarm and not very appealing. This meant that the city eventually lost his wealth and was abandoned. The neighboring cities on the other hand had it better. Hierapolis was the hot springs that were healthy and Colosse the pure cold springs. This should describe the condition of the church in Laodicea. This image uses the Lord Jesus that they will understand and be aware of their spiritual condition. 16 But thou art lukewarm, not cold and not hot. I will spit you out of my mouth. Jesus goes so drastically to the plant as in Matthew 23 When he rebukes the Pharisees and the scribes. Now Jesus uses the same powerful verbal attack against his own church, or are they no longer his church? They live in a spiritual self-deception that Jesus opposes strongly. Because you are lukewarm, he is the nausea of them! Matt. 7. 21 Not every one that saith unto me, Lord, Lord! will enter the kingdom of heaven, but whoever does my Heavenly Father. 22 Many will say to Me on that day, 'Lord, Lord! Have we not prophesy in your name, and cast out demons in Your name done many mighty works in your name? 23 And then will I declare to them, I never knew you. Away from me, you evildoers! 17 "I am rich," you say, "I have abundance and lacks nothing." But you do not know that you are wretched, pitiful, blind, poor and naked. This duality which basically is hypocrisy Jesus warned against the strongest. You mean the church proved to be rich, successful and everything is in the most beautiful and best order. But it is exactly the opposite. Miserable might be responsible for the care for those who fall without a past is gone, a grower just friendship with their own friends. Pathetic can stand to lack spiritual backbone. Blind is no longer tell the difference between something in the spiritual world. The poor are losing favor gifts and fruit of the Spirit. Naked is losing salvation kledebon. Here was the church in the deepest and utmost spiritual distress and need. 18 Therefore I give you the advice that you buy from me gold refined in fire, so you can get rich, and white clothes that you can dress you and hide your naked shame, and salve to put on your eyes, so you can see. But the offer of restoration and return to him was in force even in this church. But when they had to get back a tried and persevering faith. White clothing is not to be defiled by sin and the world's unclean. Furthermore, it was supply and demand of the heart opplatte eyes. It's really where we all have to come back to! Eph. 1. 17 I pray that our Lord Jesus Christ, God, the Father of glory, must let you have the Spirit of wisdom and revelation, so you learn to know God. 18 Had he eyes of your heart light, so you understand the hope to which he has called you, the riches of his glorious inheritance in the saints, 19 and where his power really is with us who believe. With this tremendous power and strength 20 he left Christ from the dead and set him on his right hand in heaven, 21 over all powers and authorities of all might and dominion and above every name that is named, not only in this world, but also in the future. 22 Everything he put under his feet, and him the head over all things, he has given to the church, 23 which is his body, the fullness of him who fills all in all. To pray such a prayer each day will have a major impact on all his life. 19 All that I have loved them rebuke and chasten me. Let it be seriously and turn on! Is this done in love? How is the love that we read about in the 1st Cor. 13? v. 6 does not rejoice in iniquity, but rejoices in the truth. It had to be serious and must take it into that message came to them. The entire congregation was very difficult to accept the message because they would have it scratched them in the ear. But it was, if possible, some understand the church that would take it to heart? They would experience the close fellowship and communion with Jesus again. 21 He who overcomes, him I will sit with me on my throne, even as I also overcame and sat down with my Father on his throne. Again addressing the Lord to the victorious and who wish to follow him. Once saved, always saved is one of Satan's biggest lies. Salvation is something one must also grow in and take care of. For whoever wins, a few the same position and the position himself. We will sit with Christ in the heavenly. Eph. 2. 6 In Christ Jesus he raised us up from death with him and put us in heaven with him. 22 He who has ears, hear what the Spirit says to the churches! For the last time and to the church in Philadelphia as to all other believers through the ages, he who has ears, he \ she hear what Jesus says to the church and the individual! Seven angels, ie, seven messengers to the angels means, would bring the letters to the respective congregations. Revelation. 1:11.20. These were human messengers who were not only ambassadors but also readers of the message at each site. Revelation. 1:3. Matt. 11:10. Interest historically happened approx. 90 AD Seven churches were read to each send letters. Since these send a letter has been read all over the world and become a spiritual lesson for many. Rom. 15:4. But sending the letters have another meaning. For Jesus Christ said to John: "Write what you saw, it is now and what will come after this, and the mystery of the seven stars which you saw in my right hand, and the seven gullysestaker: The seven stars are angels the seven churches, and the seven candlesticks are seven churches. " Revelation. 1:19-20. Revelation is a prophetic book. Revelation. 10:19 p.m.. It gives prophetic vision of Daniel 70 åruke ie the last seven years of this age. Revelation. 6:1-19:21. Entire åruken described by the seven seals, seven trumpets and seven bowls anger. Seven-figure stands in scripture for integrity and accomplishment. 1.Mos. 2:2. But sjutallet is used by John is not only about what is to come, but it is now. The apostle is asked to write to seven churches, yet there were several on the mainland of Asia Minor. It was at least congregations in Troas, Colosse and Hierapolis. Acts. 20:6-7. Kol. 1:2. 4:13. The seven churches were following each other in a circle. The apostle saw the seven churches as seven gullysestaker as seven stars brought the message to. It was a night scene in the character's shape spoke about the church's mission in a dark world. Revelation. 1:1. File. 2:15-16. After just seven churches mentioned, it is a sign of a prophetic panorama of the whole church on earth. It is the secret that John was revealed. Such prophetic panorama we also meet in 3.Mos. 23 with a discussion of the seventh day and the seven seasons, and in Dan. 9 with coverage of 70 x 7 years and in Matt. 13 with mention of the seven parables. In all send letters comes a command to hear the Spirit's voice and a promise to the victories. In the first three letters will send the command before the lift. Revelation. 2:7.11.17. But in the last four letters will send the promise before the commission. Revelation. 2:28-29. 3:5-6.12-13.21-22. In the last four send letters, we also learn that Jesus is coming again. Revelation. 2:25. 3:3.11.21. The structure of sending the letters testify to various periods in church history. This has become clearer in the course of history. This principle held up the Jesus to Peter: "What I do, you do not understand now, but you will understand later." Joh. 13:7. This principle was also the prophet Daniel heard of by an angel. Dan. 12:4.9. Send letter to Ephesus speaks of the church the first time from approx. 30 to 100 AD Revelation. 2:1-7. It began with a passionate love that decreased gradually. Hebrews is a testimony to this. Heb. 10. 24 Let us have a concern for each other, so we enthusiastic about one another to love and good deeds. 25 And let us not keep us neglect our church meetings, as some people do. Let's encourage each other, so much more, as ye see the day approaching. Likewise, the message of the church in Ephesus. Obvious. 2. 4 But this I have against you, that you have forsaken your first love. Here we see that even among the early Christians were falling away in evidence. But the church was still desirable, as Ephesus the means. Send letter to Smyrna speaks of the church's time of approx. 100 to 313 AD with strong persecution of the Christians in the Roman Empire. Revelation. 2:8-11. Jesus' words in Matt. 5:10 was achieved in this period: "Blessed are they who are persecuted for righteousness' sake, for theirs is the kingdom of heaven." In a time of persecution was needed myrrh, which was used to relieve pain. Mark. 3:23 p.m.. Smyrna means myrrh. Send letter to Pergamum speaks of the church's time of approx. 312 to 606 AD Revelation. 2:12-17. The 312 was Constantine's conversion to Christianity. Pursuit time was replaced by a forførelsestid, where the church married the state. Pergamum means general marriage. One was landed at James. 4:4 warned against: "It will be the world's friend becomes God's enemy". Send letter to Thyatira speaks about church time from 606 AD to Christ's return. Revelation. 2:18-29. In 606 AD the Roman bishop Boniface elected universal bishop. With this came the papacy in the function. A worldwide church with Rome in the center has seduced many with the introduction of pagan customs in Christianity. Revelation. 17:4. Remarkable is that Thyatira means repeated sacrifice. Send letter to Sardis speaks of the church's time from 1517 to the Second Coming. Revelation. 3:1-6. In 1517, hung Martin Luther, the 95 theses on the church door in Wittenberg. With that started the Reformation, which Calvin and Zwingly were pioneers for. Scripture alone that was stressed, leading to spiritual awakening. But eventually many nominal Christians. Remarkable is that the Sardis means those who escaped. Send letter to the Philadelphia talks about the church's time of approx. 1750 to the Second Coming. Revelation. 3:7-13. John Wesley and George Whitefield was the revival that instrument and was followed by William Carey as the modern missionary father. An open door for missions, it was during this time and in the wake of this, the New Testament churches arranged characterized by brotherly love. Philadelphia means brotherly love. Send Letter to Laodicea speaks of the church's time of approx. 1900 to the Second Coming. Revelation. 3:14-22. In that time, democracy mentality was prominent instead that Christ has been steering his church. Remarkable is that Laodicea means democracy. The result has been a lot of complacency and lukewarmness. Sending letters reveals that three community types were characterize the church the first time, while four community types will affect the church's past time. As Paul had discovered the secret of the church, had John on Patmos revealed the secret of the church on earth. Eph. 3:4-6. Revelation. 2:1-3:22.